Note: This pattern has been updated into modern language but has not yet been test knit. This pattern is very simple and can be easily adjusted to fit any size. Work 10″ k2 p2 rib on the remaining 28sts, ending on a right side row. Do not cast off. Next row: Work k2, p2 rib on the 28 sleeve stitches, cast on 64sts, work k2 p2 rib across the 28sts form the first sleeve. Continue in k2 p2 rib for 22″. Cast off. 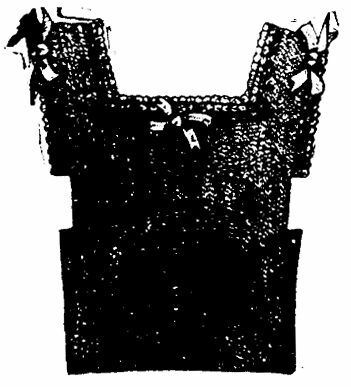 Sew up the side seams, leaving about 7″ open for each sleeve. Using a 3mm hook, work one single crochet (UK double crochet) into each stitch around the neckline. If the crochet ripples too much either use a smaller hook or work into 2 out of every 3 stitches. Next round (crossed trebles): *yarn round hook twice, put hook through next stitch, yarn round hook and draw through, (4 loops on hook), yarn round hook and draw through two loops (3 loops on hook), miss 2 sts, work a double crochet in the next stitch, (3 loops on hook) , yarn round hook, draw through 2 loops, yarn round, hook, draw through remaining 2 loops, 2 ch, work a dc into the first treble. Repeat from * to the end of the round. 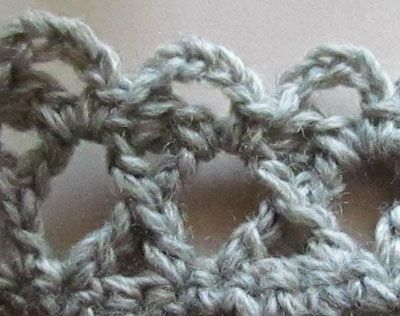 Join to the beginning of the round with a slip stitch. Next round: *Work a single crochet into the top of the first stitch, 4 chain, double crochet into the same stitch, miss 2 chain ; repeat from * around, working the next single crochet, 4ch, double crochet into the gaps between X’s . Join with a slip st to the beginning of the round. Thread a ribbon through the row of crossed treble stitches and tie in a bow. Work the same crochet edging around the sleeves, thread with a ribbon and tie bows at the top of the sleeves.